Two weeks ago Goldie's Italian Pizza opened up on G St NW. His place was doing awesome business. Everyone in the neighborhood was a critic, with many good and bad reviews. Yesterday, a new Quizno's sandwich shop opened right next to Goldie's and the owner was outside at the door inviting people in for pizza. Some people thought that might be humiliating until I mentioned that Jimmy the owner of the successful Xchange Saloon invites his customers in from the door daily. 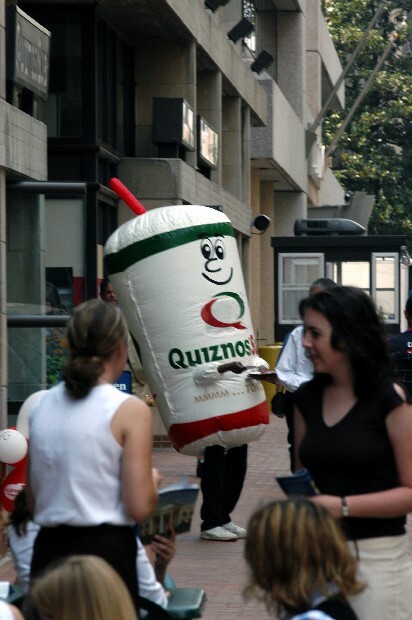 I think Quizno's is the first time I've seen a door greeter on G St in a costume.